January 31, 2017 – ROCK HILL, SC – This week in York County, South Carolina, the region’s first sonnenBatterie residential energy storage system became operational. While over 16,000 such systems have been installed worldwide, this is currently the only one in the Carolinas. The installation was completed by the Charlotte-based company Renu Energy Solutions, which since 2010 has provided installations of solar photovoltaic electric systems and other energy efficient devices for home and business. The energy storage system is engineered in Germany and is made in the U.S.A., and uses lithium iron phosphate battery banks to hold power produced by the customer’s solar photovoltaic array. Consumer-owned solar continues to grow rapidly in the Carolinas, and battery storage for home and business is poised to be of great help to meet energy challenges in this market. 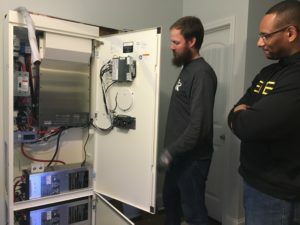 Not all grid-connected solar customers choose to add energy storage, but for some it is an important part of an energy system that will meet their specific needs. 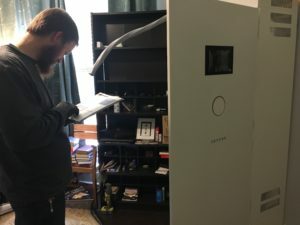 “sonnen’s proven and safe storage technology, which is developed and manufactured in the U.S., empowers homeowners to manage their self-produced energy and gain greater energy independence by taking control of their own energy. Our partnerships with solar and energy efficiency providers like ReNu Energy Solutions are key to providing integrated solar and storage products to new markets like South Carolina,” said Blake Richetta, VP of North American Sales for sonnen. The battery system is under manufacturer’s warranty for 10 years or 10,000 cycles. Renu Energy Solutions offers no-cost home visits by experienced energy professionals to address customers’ energy storage needs and answer questions. Consulting appointments are available now. At sonnen, we believe clean, affordable, and reliable energy for all is one of the greatest challenges of our time. With 16,000 sonnenBatterie systems installed worldwide, sonnen is a proven global leader in intelligent energy management solutions that provide greater energy control for residential customers through increased solar self-consumption, reduced peak energy usage and reliable backup power during outages – contributing to a cleaner and more reliable energy future. sonnen has won several awards for its energy innovations and sonnenBatterie products, including MIT’s Zayed Energy Innovation Award for 2017, Cleantech Global 100 for “Continuing Innovation” Award in 2017, Technology Review’s 50 Smartest Companies 2016, Greentech Media’s 2016 Grid Edge Award for innovation, and Cleantech’s 2015 Company of the Year Award in both Israel and Europe.